DETROIT (AP) — Niko Goodrum and John Hicks were in no mood to wait for a deep count against Trevor Bauer. Bauer allowed home runs to Goodrum and Hicks, who powered Detroit over the Cleveland Indians 4-1 Wednesday for the Tigers‘ sixth win in seven games. Bauer (1-1) gave up four runs and 10 hits in 5 2/3 innings. He had allowed one run and one hit in his first two starts. Indians: CF Leonys Martin needed lengthy treatment after being on the right hand by a pitch in the sixth inning. He stayed in the game. 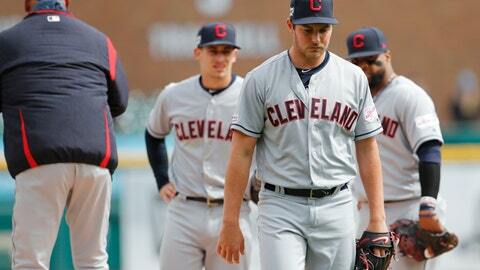 … RHP Mike Clevenger (back) was evaluated on Tuesday by Dr. Mark Schickendantz. Clevenger will rest for 6-8 weeks before resuming baseball activities. … SS Francisco Lindor (ankle, calf) took grounders and did limited running.